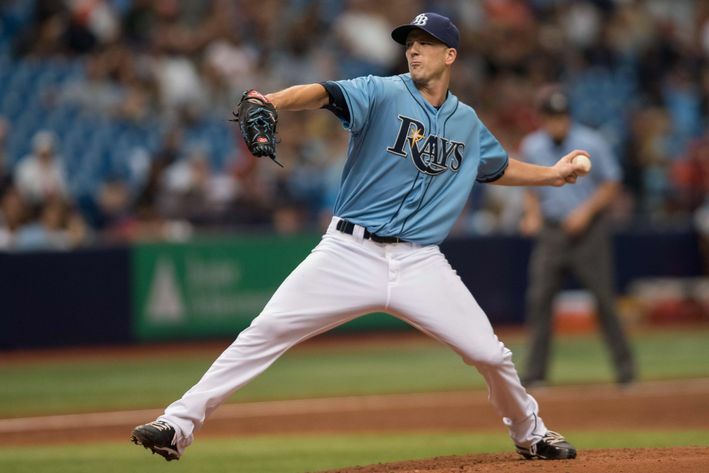 The Tampa Bay Rays look to bounce back from last night’s 5-4 loss against the New York Yankees with Blake Snell on the mound tonight. Tampa Bay hit four homers yesterday, two each by Kevin Kiermaier and Steven Souza Jr. The Outlaw is currently in the midst of a career-long 12-game hit streak, and has 11 homers — his highest total with the Rays. On the whole, the Rays have mashed 188 homers; they need to hit 12 more to set a new franchise record. Blake Snell (5-7, 3.39 ERA) will get the start for Tampa Bay, opposite of Michael Pineda (6-11, 5.80 ERA). Snell allowed just one earned run on two hits and two walks over six innings on Saturday. The southpaw put together one of the best starts of his career, in spite of the residual effects of a leg bruise incurred against Against Houston in his last start. Snell recorded 13 whiffs overall, and put in his longest outing since July 24 against the Athletics, while also snapping a two-start losing skid. Pineda threw 87 pitches over four innings on Sunday, allowing two runs on five hits and two walks while fanning four. He came away with a no-decision. It was his shortest, and most inefficient, outing since being chased by the Rays after 3-2/3 innings on May 28. Pineda has managed to pitch six innings just three times in his last six turns, posting a shaky 5.01 ERA and 1.36 WHIP over 32-1/3 innings over that span. You can read more about the pitching matchups in our series preview. — Matt Duffy underwent left-heel surgery today in Charlotte, NC. Dr. Bob Anderson (team orthopedist for the Carolina Panthers) performed the surgery. Duffy will return to the Bay Area on Saturday and miss the remainder of the season. The Tampa Bay Rays continue their last chance 10-game home stand on Monday when they welcome the New York Yankees into Tropicana Field for a three-game series. The two last faced one another about a week ago, when New York took two of three from Tampa Bay. Yet the Yankees only amassed a +5 run differential over the three games, meaning the Rays were more than capable of performing better than they had. Truth told, if it wasn’t for a pitching staff that was incapable of holding the lead in the final game of that set, we’d be talking about a series win for the Rays. The Rays have won just two of their last six, while the Yankees damaged their AL East title hopes with a poor home stand. New York is 10-6 against the Tampa Bay. Joe Girardi will start one of the worst pitchers in the AL, CC Sabathia, on Monday, and rookie sensation Luis Severino in the finale. A mystery hurler will throw in the middle game of the series. Kevin Cash will counter with Erasmo Ramirez, Jake Odorizzi, and Chris Archer. Ramirez (10-5, 3.96 ERA) fanned nine Tigers on Tuesday. However, despite entering the sixth with a 5-1 lead, the righty couldn’t hold a four-run lead for the second consecutive start. Ramirez is 2-0 with a 1.80 ERA in five career appearances (two starts) against the Yankees. Odorizzi (7-8, 3.21 ERA) collected a quality start Wednesday when he blanked the Tigers on six hits and a walk while striking out six to notch his seventh win of the season. He is 3-3 with a 2.61 ERA in 10 starts at Tropicana Field this season. Archer (12-11, 2.95 ERA) got a no-decision Friday despite striking out seven consecutive batters (at one point) and allowing three runs on five hits. He lost his last start to the Yankees after relinquishing four earned runs in 6-1/3 innings on September 6. 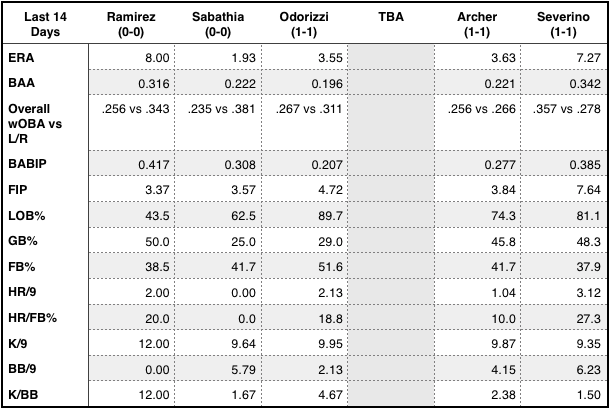 Rays and Yankees series starters over the last 14 days. Rays and Yankees offensive production over the last 14 days. CC Sabathia (4-9, 5.16 ERA) has gone 0-1 with a 4.43 ERA in eight outings since the All-Star break. He pitched Wednesday for the first time since August 23, wearing a new, tighter brace that better holds the ligaments in place in his surgically repaired right knee. He gave up three runs over 4-2/3 innings in a 5-3 loss to Baltimore. The southpaw is 6-13 with a 4.47 ERA in 26 starts against Tampa Bay since joining the Yankees in 2009. New York is 3-10 in his starts at Tropicana Field. Key matchups: Joey Butler (1-3, HR), Asdrubal Cabrera (5-14, 2B, HR, RBI, BB), Logan Forsythe (6-12, 2 2B, 2 HR, 3 RBI), Evan Longoria (24-61, 8 2B, 6 HR, 14 RBI, 13 BB), Grady Sizemore (3-10, 2B, 2 HR, 4 RBI, 2 BB), Steven Souza Jr. (1-2, BB). Luis Severino (3-3, 3.35 ERA) held the Rays to one run over 6-1/3 innings on September 9, although he was hammered to the tune of six runs on six hits in just 2-1/3 innings against the Blue Jays on Friday. As I previously wrote of the righty, Severino relies primarily on his 96 mph four-seam fastball and 90 mph slider, also mixing in an 89 mph change-up. It will be interesting to see what the Rays can do against the highly touted hurler the second time facing him. Key matchups: Asdrubal Cabrera (1-2, BB), Logan Forsythe (1-3), James Loney (2-2, BB), Evan Longoria (1-2, HR, RBI), Daniel Nava (1-3, 2B), Grady Sizemore (1-4). ― This is the final meeting of the regular season so expect both teams to try and get big wins over their division rivals. The Tampa Bay Rays losing streak hit a fevered pitch on Saturday, after the New York Yankees took the second game of the series in their final at-bat and winning by a score of 3-2. Tampa Bay has now lost a season high seven straight, and 11 of its past 13. 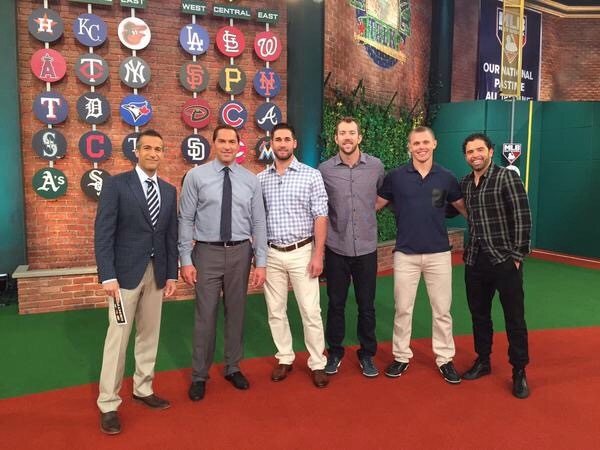 The team starts the day three back of the Yankees in the AL East. The Yankees took the lead in the first inning against Nathan Karns, taking advantage of the Rays righty before he settled in. Brett Gardner led off with a first pitch single up the middle and Chase Headley hit a grounder into right, moving Gardner into scoring position. Alex Rodriguez followed with an RBI bloop single into right, plating a run and moving Headly to third. Mark Teixeira sacrificed for the second run, capping the rally. Of the 37 runs Karns has allowed, 13 have come in the first inning. Yet Karns was very tough on the Yankees from there, tossing six scoreless innings to finish his outing, and fanning a career high 10. The Rays righty scattered five hits and two walks; retiring the final seven batters he faced, and holding New York to 1-6 wRISP over the course of his seven inning start. Unfortunately, the Rays couldn’t pounce on their limited opportunities against Michael Pineda, who also struck out 10 and walked just one. 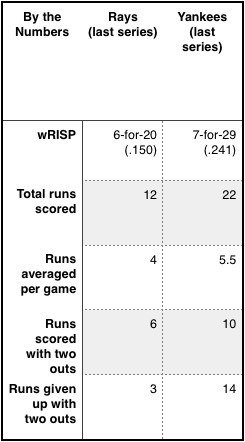 The Rays went 0-6 wRISP against Pineda — 0-9 overall — and had their best scoring opportunity in the second. Asdrubal Cabrera led off the inning by lacing a double to left, then Kevin Kiermaier followed with by working a six pitch walk. But Jake Elmore popped up a bunt attempt, Curt Casali struck out, and Grady Sizemore bounced to third to end the inning and the threat. Pineda, much like his opponent, settled in and retired 18 of 19. It was the Tampa Bay’s third consecutive game where they didn’t score with Karns was on the mound. Curt Casali hit a 2-1 double to start the eighth and chase Pineda, yet Justin Wilson struck out Brandon Guyer and Joey Butler, and Dellin Betances coaxed a grounder to third out of Evan Longoria to end the inning. Meanwhile Kavin Cash called upon Brandon Gomes to work the eighth, and he responded by posting a perfect frame — setting the table for an improbable ninth. James Loney got the inning started with an opposite field single, and then Steven Souza Jr, who was 0-26 with 16 strikeouts entering the game, crushed a 2-2 homer to left on a hanging breaking pitch. It was the first homer Betances allowed in 2015, and the team leading 15th home run for Souza. Betances retired the next three batters to keep the game tied, giving the appearance the contest would go into extras for the second straight day. However, the game never made it into extra innings. Mark Teixeira doubled past the shift into the right field corner against Brad Boxberger to start the Yankees half of the ninth. Joe Girardi called upon Jose Pirela to pinch run for Teixeira, and pinch-hitter Chris Young walked after falling behind 0-2 to Boxberger. With a pair on, Ramon Flores pushed a bunt up the third-base side of the infield. Evan Longoria called for it, yet Boxberger, who already picked the ball up, looked to second, then made an off-balance throw to first. Jake Elmore, who was covering first, tried to scoop it, but the ball glanced off his glove. Elmore corralled it before the ball could bound away and threw home, but it was too late — Jose Pirela slid across the plate, scoring the winning run. It’s frustrating that the outcome of the game is based on one throw that should be pretty simple, Boxberger said of his part of the botched play. Just in that situation, I didn’t set my feet, just rushed it a little bit. And that’s what happens. I set up on the bag, saw it in the dirt and tried to read the pick. It was like a snow cone, and then when you try to pick through it with force, sometimes it catapults the ball a little bit. … I know he’s going, so as soon as it pops up I know I’ve got to catch and throw, so I spun and threw and (catcher Curt Casali) caught it, but (Pirela) slid in behind him. Well, if there was any question that we were in a bad funk coming into the game, we solidified that with today’s game. The Rays won’t take on the Yankees again until early September. With that in mind, Sunday’s series finale provides the last opportunity for the Rays to force a two-game swing in a close American League East race. Erasmo Ramirez (6-3, 4.01 ERA) will take the mound for Tampa Bay, opposite of Ivan Nova (1-1, 1.50 ERA since returning from Tommy John surgery). The Yankees are going for the sweep, while the Rays look to snap a seven-game skid. Initially scheduled to take the hill for New York in the finale, the Yankees decided to push CC Sabathia’s start back to Wednesday. You can read more about Ramirez in our Rays/Yankees series preview. — Grady Sizemore is not in the lineup today because Evan Longoria is hitting DH, and the Rays prefer better outfield coverage. — RHP Ronald Belisario, designated for assignment last week, cleared waivers and elected for free-agency. — Grady Sizemore finds himself leading off tonight, while the struggling Steven Souza Jr. is off once again. The Rays agreed to sign Luis Leon and Jhosmer Vargas, a pair of 16-year-old Venezuelan shortstops, for low six-figure bonuses. Leon is 6-foot-1, 170 pounds with a good swing from both sides of the plate. His tools are steady, with average speed and a little more strength helping his bat, with more line drives than power, and a chance to stay in the middle of the field. Leon, who signed for $125,000, trains at Carlos Guillen’s academy. Vargas is another switch-hitter, with a little less size (6 feet, 160 pounds) but a tick better speed and a quick, contact-oriented stroke with skills that started to pop more as July 2 approached. Leon signed for $100,000 and trained with Henderson Alvarez (not the Marlins pitcher). 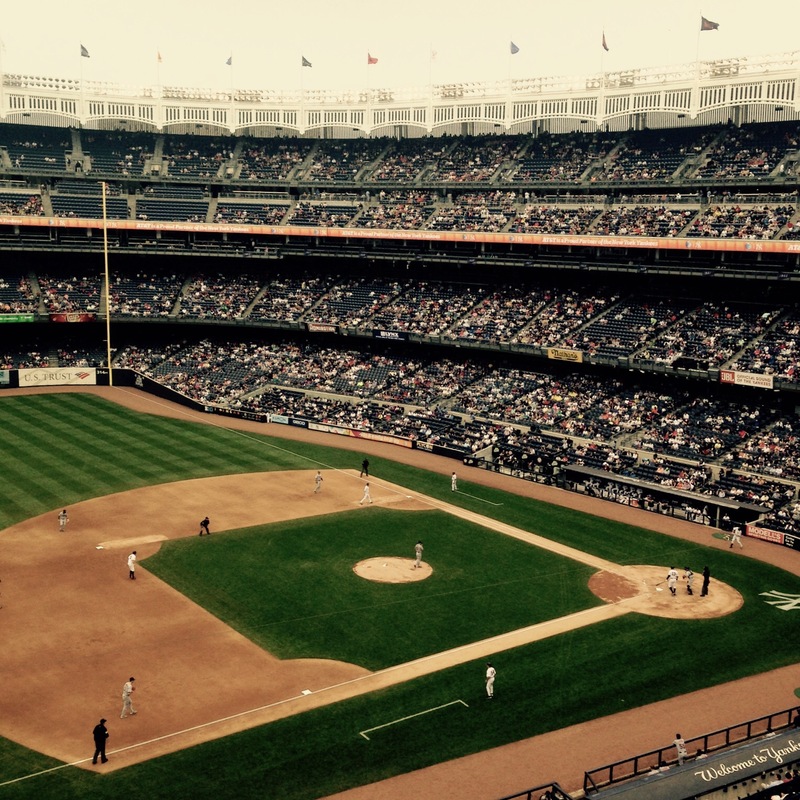 — Read about the Rays/Yankees series in our preview. — Don’t forget, our next watch party takes place tonight at Green Bench Brewing Company. The Tampa Bay Rays bounced back against the Evil Empire on Tuesday, rallying scoring two in the seventh and the eighth off starter Nathan Eovaldi to beat the Yankees, 4-2. 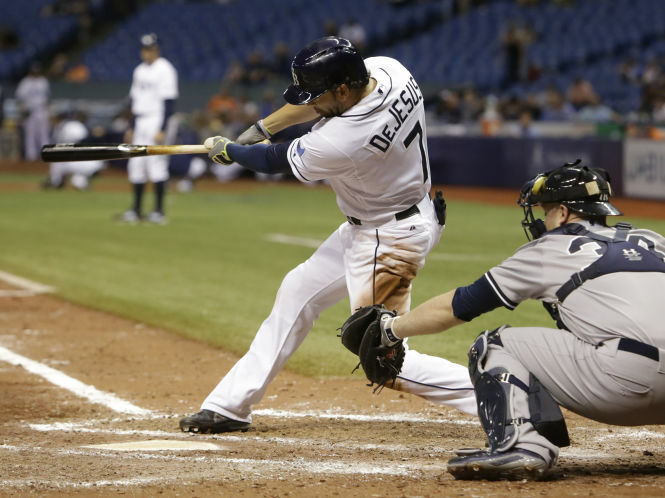 Thanks to the late rally, the Rays earned back the game they lost to the Yankees on Monday. The Rays would not have won the game without a terrific (and gutsy) start by Chris Archer. The Yankees took an early 2-0 lead in the first inning when the first five hitters reached on four singles and a walk. After a mid-count meeting on the mound by third baseman Evan Longoria, presumably to let the Rays starter know the Yankees were keyed in to the Rene Rivera’s hand signals, Archer settled down and sailed for the duration of his start. We changed the signs, Rivera said following the game. Once you get a couple guys at second and they get another guy at second, you think they might see what your signs are. … Longo is on top of the game every time, and he made sure to tell us to make sure we did that at that moment. The change helped, and it all started with a strikeout of Chase Headley. The whiff was followed by a Stephen Drew to fly-ball out to shallow center, and an inning ending ground-ball out to second by Garrett Jones. Archer allowed one-out singles to Jacoby Ellsbury and Brett Gardner in the second, but Rivera nullified the speedy threats by throwing out both as they tried to swipe second. As Marc Topkin (Tampa Bay Times) noted, Rivera became the first Rays catcher with two caught stealings in an inning since Dioner Navarro in August 2008. Throwing out those two guys, two speedy guys for them, that was huge in the game, Rivera said. Archer was dominant from there, retiring 15 of his last 16 (10 consecutive) and taking a no-decision — he remains unbeaten in seven career starts against the Yankees. I was honestly not thinking about the situation. I was just thinking about executing my pitches, and I knew that the hits that they were getting, that wasn’t going to beat me. If I stayed down in the zone, use my fastball, use my slider, that that wasn’t going to continue to happen throughout the game. Offensively speaking, Tampa Bay trailed New York 2-0 headed into the seventh, but the team rallied to knot things up against Nathan Eovaldi. Evan Longoria got things started by looping a single to left field, then advanced on a James Loney groundout. The productive Logan Forsythe walked, and both runners moved up 90 feet on a wild pitch — the first of three. Both scored when David DeJesus singled to center field. At 13 RBI thus far, DeJesus is just six shy of his total of 19 the year prior. The Rays took the lead in the eighth on another two-run rally. Kevin Kiermaier walked with one out, and moved to third when Steven Souza Jr. hit a blooped a single just out of the reach of the Yankees second baseman. Dellin Betances entered the game in relief, and Longo came through with a first pitch sacrifice fly to deep center field. After Souza stole second, and Loney intentionally walked intentionally, Betances uncorked a pair of wild pitches which allowed Souza to score an insurance run. Kevin Jepsen worked around a one-out walk in the eighth to earn the win, and Brad Boxberger worked around a soft single in the ninth to earn his ninth save. RHP Nathan Karns will get the start against Adam Warren and the New York Yankees on Wednesday night. Karns threw a career-high 117 pitches in seven-plus innings against Texas on Friday. Since taking a loss on April 7, he has allowed two or fewer runs in five of six starts. Karns will face the Yankees for the third time in 3½ weeks, and so far he is 0-0, with a 2.79 ERA. Lest you forget about Warren’s four pitch repertoire: fastball (both four and two seam, averages 94 mph), a whiffy change-up (averages 85 mph, has good depth and run), slider/cutter (averages 86 mph, has good depth and run), and curveball (averages 80 mph, has decent depth and run). Tampa Bay got to Warren to the tune of four runs on six hits on April 17th, yet didn’t fare well against him the next time they faced him. Warren held the Rays to one run on five hits through 5-2/3 in that outing. Whatever the case, the see-saw pitcher has relinquished four earned runs in three of his six starts. You can read about the match-up in our series preview. — Rays prospect LHP Blake Snell had seven more scoreless innings for the Biscuits, running his season-starting streak (including Class-A Charlotte) to 40. — The Rays won when trailing after six innings for first time this season; they had been 0-13. — Jake McGee is scheduled to make his sixth (and potentially last) rehab appearance tonight for Triple-A Durham. Per Marc Topkin, it will be the first time he pitches with only one day between outings, and he will be limited to one inning. —Is scheduled to throw his third live batting practice session today, with another BP/simulated game Monday. If all goes well, he should be able to start a rehab assignment after that. — Nick Franklin is scheduled to resume his rehab stint at Durham tonight after being off Tuesday.